4” diameter dust take-off with actuated butterfly valve vents displaced air. Automated electric bag inflation system with HEPA filter removed bulk bag creases for maximum fill volume. Fill head includes an 8” diameter actuated butterfly valve to prevent product spillage when bulk bag is not present. Fill head includes material level sensor. 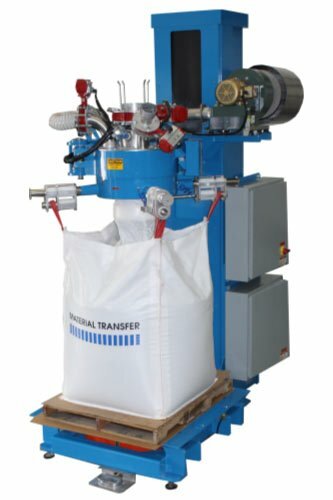 Power-Lift™ system with 48” of travel can be programmed for automatic bag stretching, including full bag lift capability. Power-Sweep™ system extends bag support carriage to operator for reach free bag connection. Unit features a heavy-duty, high output, flat top densification system with variable frequency drive to settle material during and after fill cycle.